Scoliosis is an abnormal curving of the spine. While a normal spine is arranged as a straight line down the back, a person suffering from Scoliosis may have a spine that appears more like a “C” or “S” shape. Scoliosis may be present at birth, or may develop from a nervous system problem such as spina bifida, cerebral palsy, or muscular dystrophy. However, in most cases, the cause of Scoliosis is unknown. 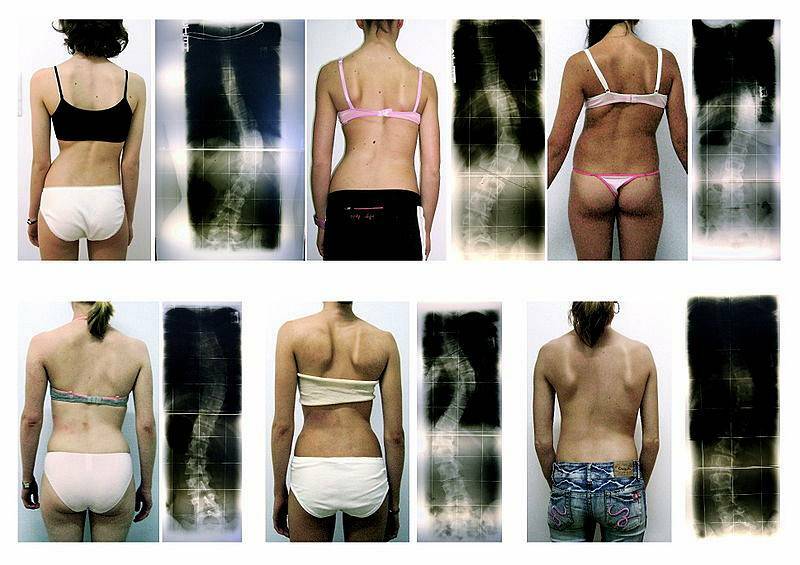 Each of these 6 women pictured above have severe cases of Scoliosis, which is visible on their bodies and in each of their corresponding x-rays. Scoliosis can worsen over time and often causes extreme pain and discomfort. It can cause the hips and shoulders to sit unevenly or the pelvis to tilt, which can cause further injury to these parts of the body as well as the spine. While back braces, surgery and chiropractic care can alleviate the pain or fix the problem, one of the best things a Scoliosis sufferer can do for their body to minimize pain is to exercise. There are a number of exercises that are perfect for strengthening back muscles and preserving vertebra health, all of which you can easily do at home with the use of an exercise ball, light hand weights and an exercise mat. Back Extension – Start with your stomach on top of the exercise ball and press your knees on an exercise mat. Lean forward over the ball into a relaxed position. From there you will come up to the point where your back feels as though it is parallel with the ball. Raise your arms and hands so they come straight out and are also parallel with the ball. Hold this position for a count of 5. Continue for a set of 10. Leg and Arm Extensions – Start with your hips over the exercise ball. Point your left foot down and extend your left hand up, keeping your right fingertips palm down, while lifting your right leg up. Hold for a count of three and then switch to the other side, pointing your right foot down with your right hand and left leg up. Continue for 3 sets of 10, taking a 30 second break between each set. Triceps Raise – Sitting on the exercise ball, place your feet flat on the mat and adjust yourself so that your spine is as straight as possible. Take a light weight in your right hand, reach behind your head and use your left hand as a brace to keep your elbow right beside your head. Pivot around your elbow joint lifting your right hand above your head, as you squeeze the back of your arm. Switch between arms as you continue for 3 sets of 10 on each side. Standing Raise – Working with light weights in a standing position bring the weights straight to your sides, then raise them straight in front of you. Be sure to keep you back straight the entire time and bring your arms up so that they are parallel to the ground. Continue for 3 sets of 10. Bent-Over Raise – Working with light hand weights, start by sitting on the exercise ball and then bend over so that you can wrap your arms around the middle of your thighs. Pick up the light hand weights and put them on your hands. You should have soft elbows but almost an extended arm. Bring you arms straight up and to your sides, so that they are almost parallel with the ground. Then bring them back down. Repeat for a set of 10. Upright Row – From a standing position, start with your arms down in front of you, your palms should be facing your legs with your weights in your hands. Begin by pulling your arms straight up so that your elbows are a little higher than your hands. Then bring your hands back down. Continue for 3 sets of 10. One-Arm Row – Leaning on the exercise ball with your left hand, take two light weights into your right hand. With a flat back, row your arm up, keeping your elbow bent, so that your elbow points to the ceiling. Squeeze your shoulder blades together when your elbow gets to the top, and then release. Switch between arms as you continue for 3 sets of 10 on each side.